Chicago Mayor Rahm Emanuel played Defender in Chief in Iowa Saturday night, touting the accomplishments of his former boss and assailing the Republicans who wish to kick the president out of office after one term. "While we meet here tonight, the Republicans are having a debate across town. Now I don't know about you, but I've watched a couple of those debates. I've got to be honest. I never thought I'd say this: I'm beginning to miss the wisdom of Sarah Palin," he said. "Their debate was called the Thanksgiving Family Forum -- which is fitting because I have never seen such a collection of turkeys." Emanuel's remarks were part of his keynote address at the Iowa Democratic Party’s Jefferson-Jackson Day Dinner in Des Moines. Officially, he was there as a proxy for President Barack Obama, who needs to win the swing state in 2012. The former White House Chief of Staff said the president made good on promises to end the war in Iraq, to significantly weaken al-Qaida and to bring health care to millions of Americans. "This is the change we believed in. That is the change we worked for. That is the change our president delivered," he said. But the appearance has some political minds wondering if Emanuel is interested in laying the seeds for a 2016 presidential race. "It sends a lot of signals. 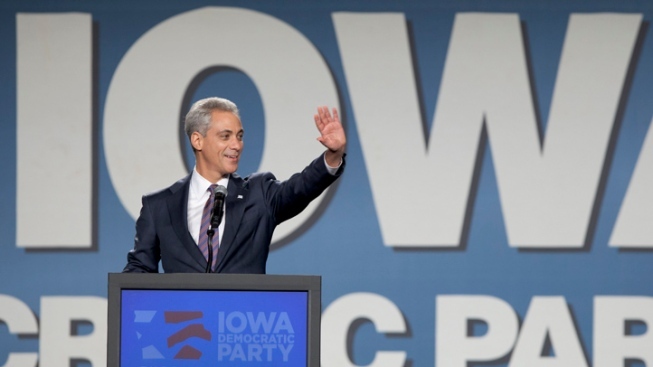 It sends a signal to Washington that Rahm Emanuel may, in fact, one day be interested in running for president," said David Yepsen, the Director of the Paul Simon Public Policy Institute at Southern Illinois University. Likewise, the Democrats haven't invited the mayor of any other city to deliver remarks, Roosevelt University political science professor Paul Green noted. "They're certainly not inviting Joe Biden," he said, adding that he's heard that Emanuel will also play a role in the Florida primary in January. Early states are already seeing a constant barrage of anti-Obama campaign ads on television from Republican candidates. In Iowa, they're "all over that state and hammering away at Obama with all kinds of negative messages and attack messages, and those charges can't go unanswered," said Yepsen. On Monday, Emanuel will be profiled on NBC's "Rock Center,"